She might tell you otherwise, but recognition for Dana Hughes was long overdue. 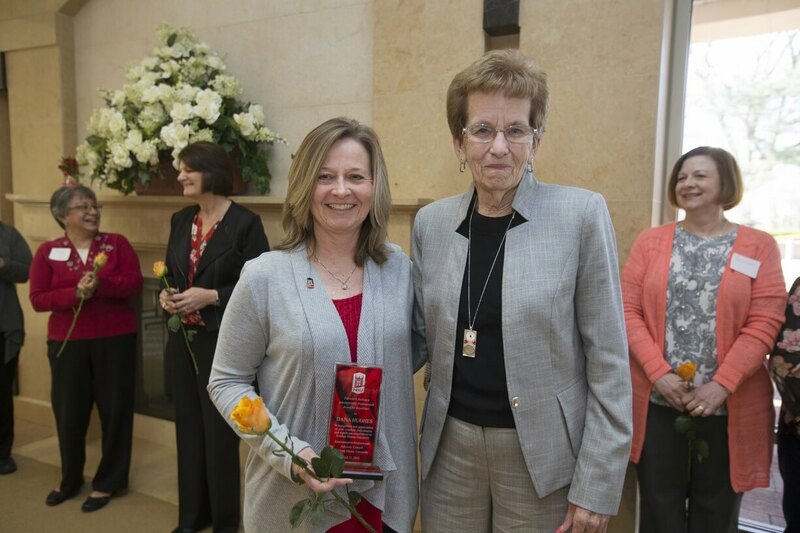 Hughes, administrative assistant in the Graduate School, recently received the 2018 Patricia S. Siebrasse Administrative Professionals Award for Excellence. The award goes to someone who demonstrates continued commitment and operational efficiency within their organization and provides meaningful contributions to NIU. “I was honored to receive the award, and I was just humbled to even be standing up there with the other nominees, along with Pat Siebrasse,” Hughes said. Hughes has worked at NIU for more than 25 years in various administrative professional classifications. She first came to NIU in January 1992 as a secretary in the Foreign Languages and Literatures department. She joined the Graduate School team about seven years ago. Why hasn’t she been honored sooner? The nominator wrote about never being disappointed upon hiring Hughes. Another letter writer said Hughes has served with distinction NIU’s largest college, which encompasses 18 departments, five centers and one division. It, by far, has the largest faculty and the highest student enrollment of any college on campus.